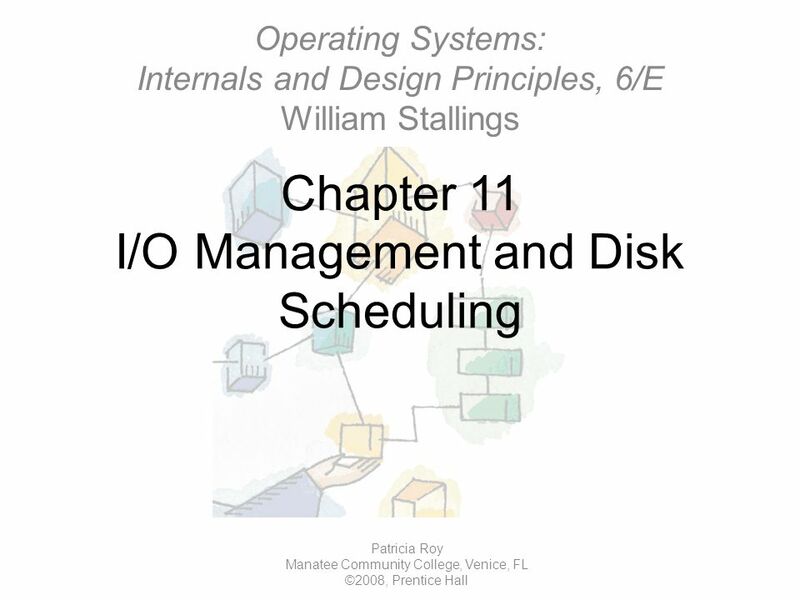 Chapter 11 I/O Management and Disk Scheduling Patricia Roy Manatee Community College, Venice, FL ©2008, Prentice Hall Operating Systems: Internals and. 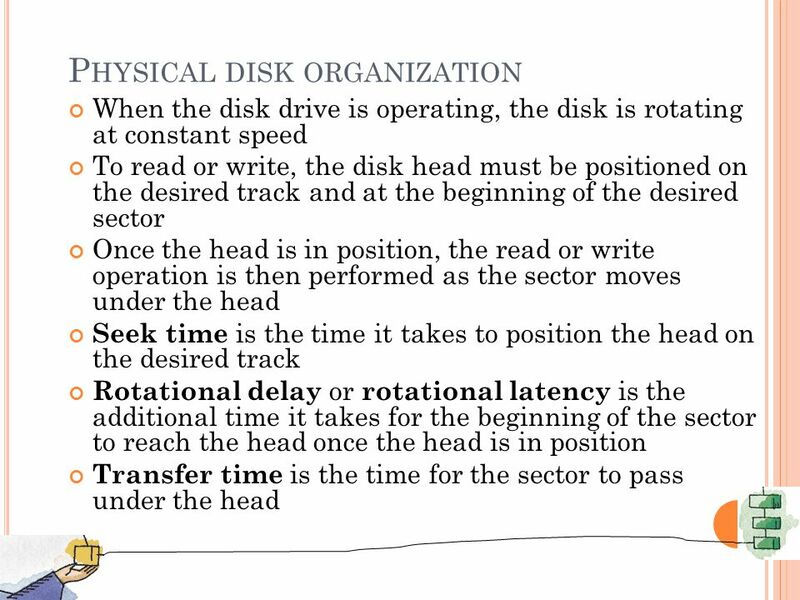 13 T RANSFER T IME Depend on the rotation speed of the disk: T = b/(rN) Where T: transfer time b: number of bytes to be transferred N: number of bytes on a track/cylinder r: rotation speed, in revolutions per second Thus, the total average access time is T s + 0.5/r + b/(rN), where T s is the average seek time. 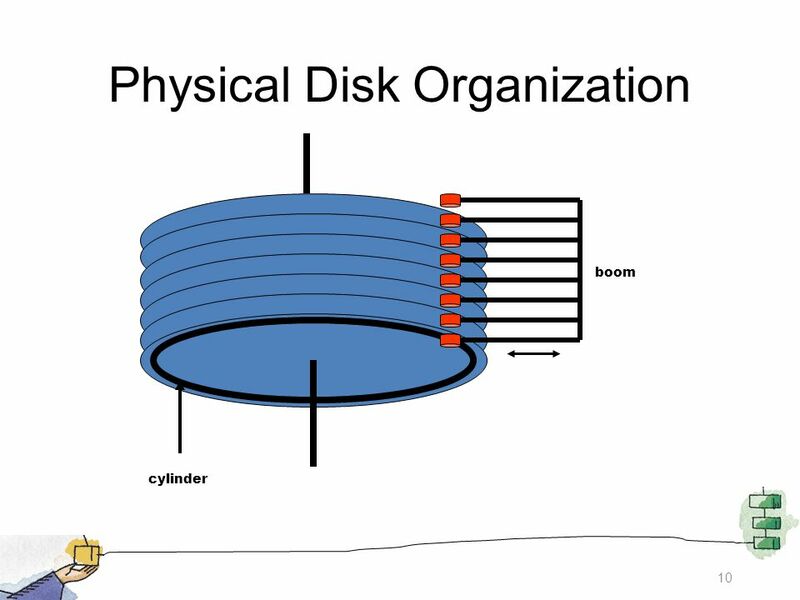 14 A T IME C OMPARISON Consider a disk with an advertised average seek time of 4ms, rotation speed of 7500 rpm, and 512-byte sectors with 500 sectors per track. 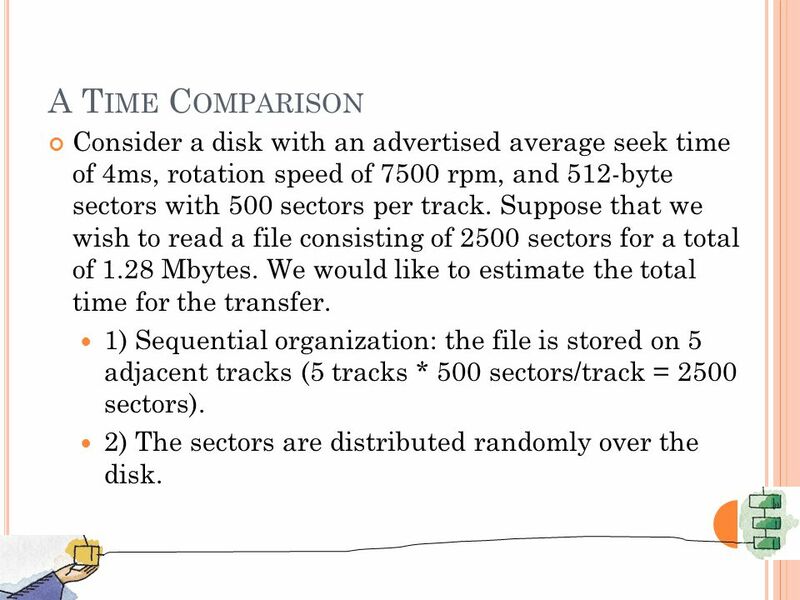 Suppose that we wish to read a file consisting of 2500 sectors for a total of 1.28 Mbytes. 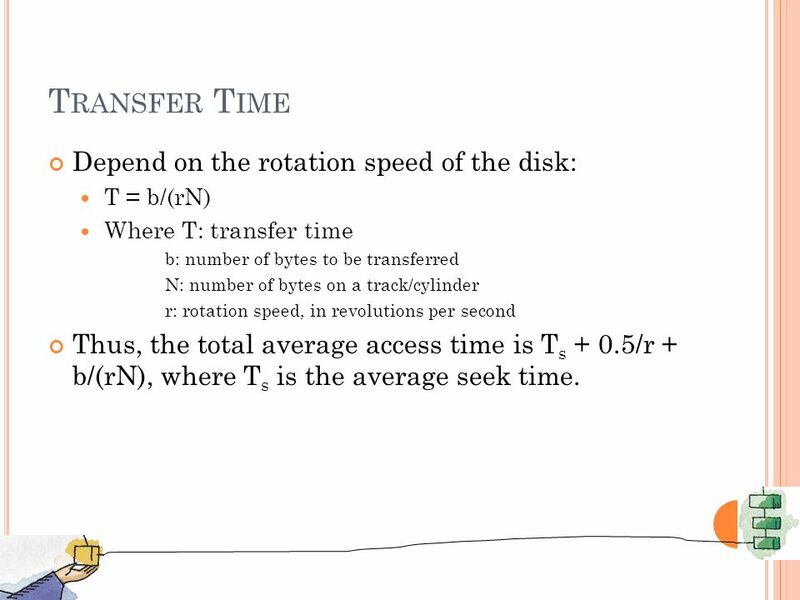 We would like to estimate the total time for the transfer. 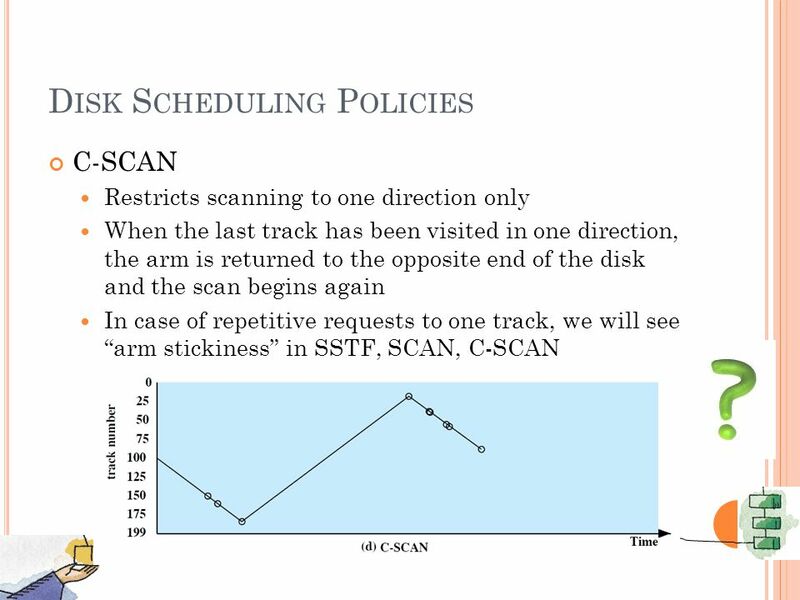 1) Sequential organization: the file is stored on 5 adjacent tracks (5 tracks * 500 sectors/track = 2500 sectors). 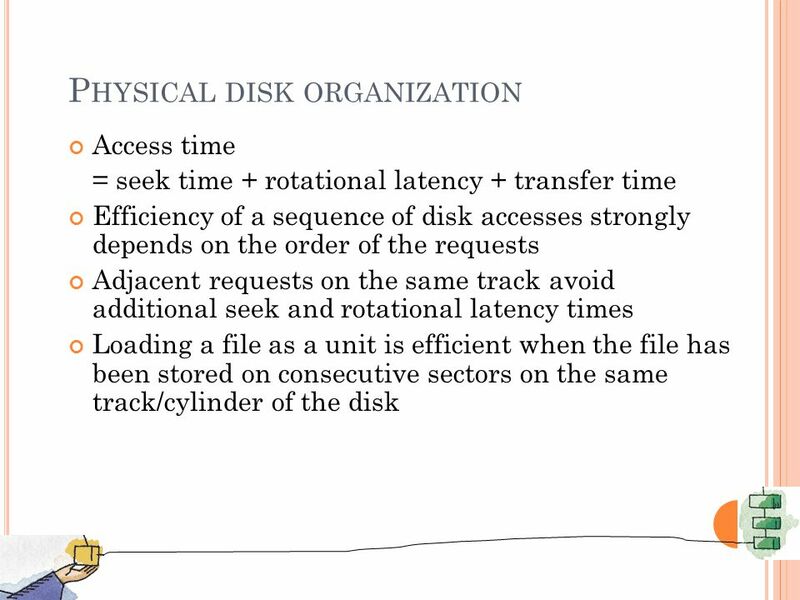 2) The sectors are distributed randomly over the disk. 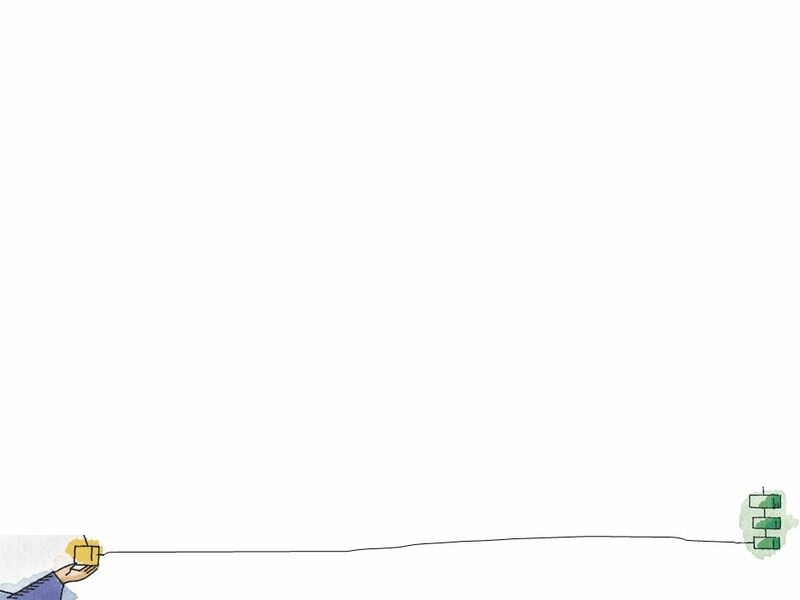 23 I N -C LASS E XERCISE Prob. 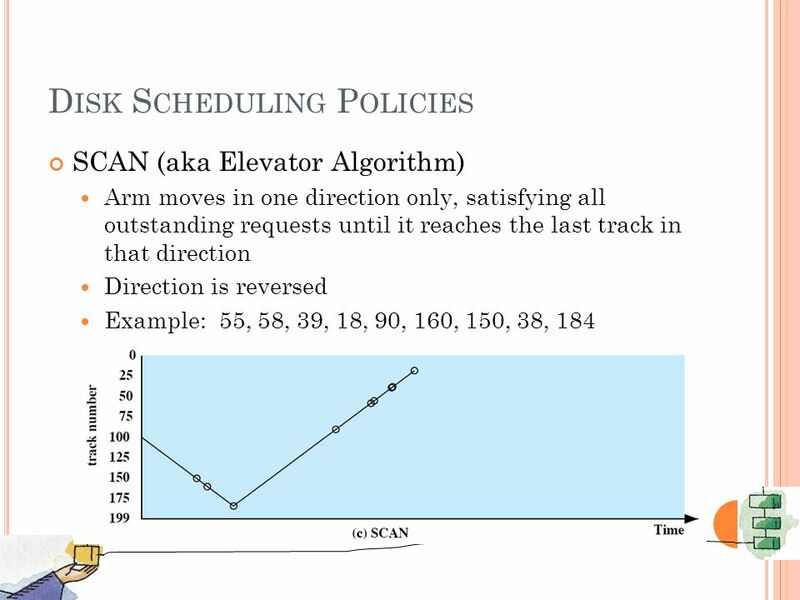 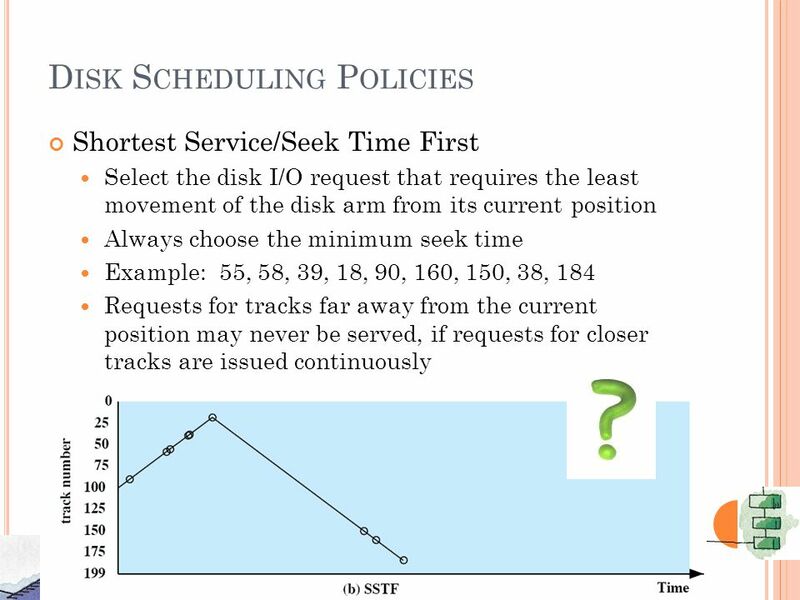 11.3 a) Perform the same type of analysis as that of the previous table for the following sequence of disk track requests: 27, 129, 110, 186, 147, 41, 10, 64, 120. 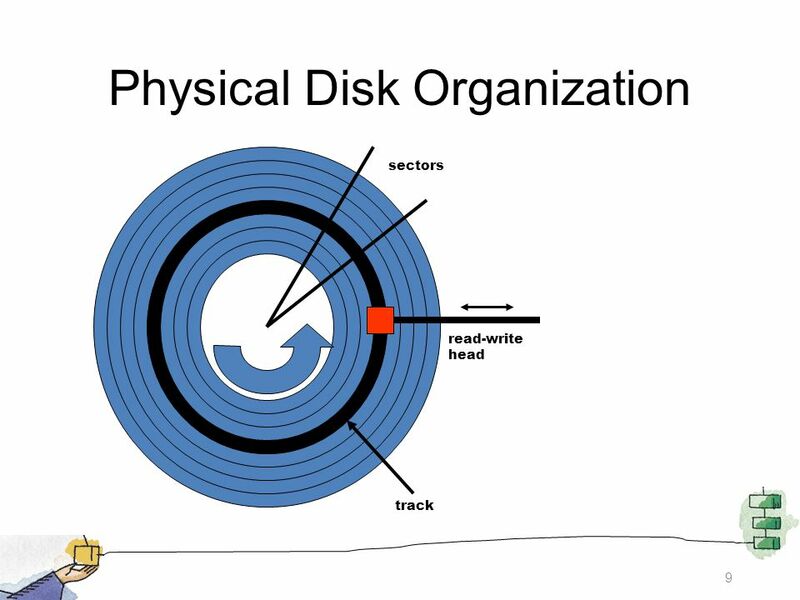 Assume that the disk head is initially positioned over track 100 and is moving in the direction of decreasing track number. 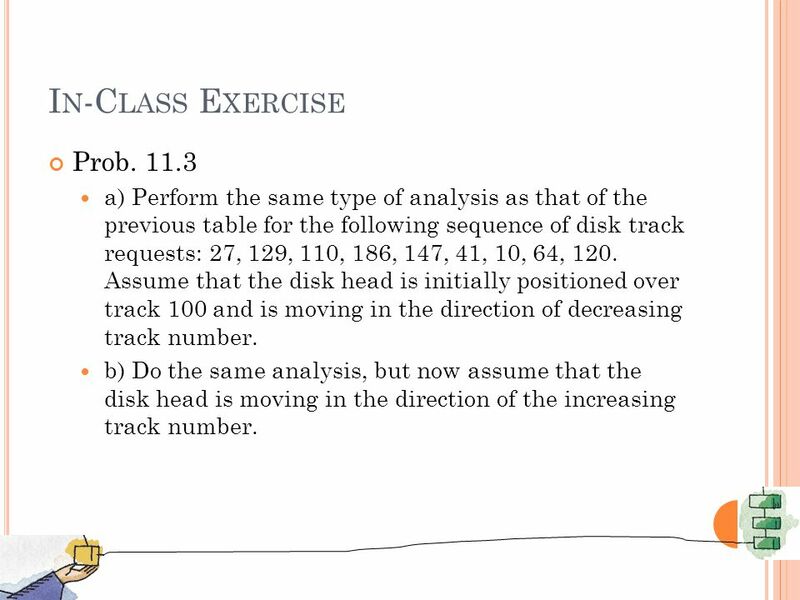 b) Do the same analysis, but now assume that the disk head is moving in the direction of the increasing track number. 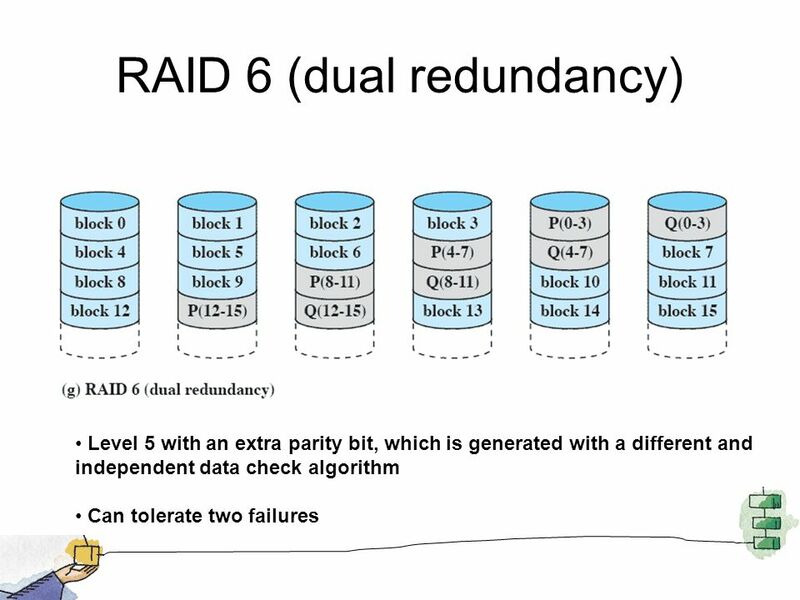 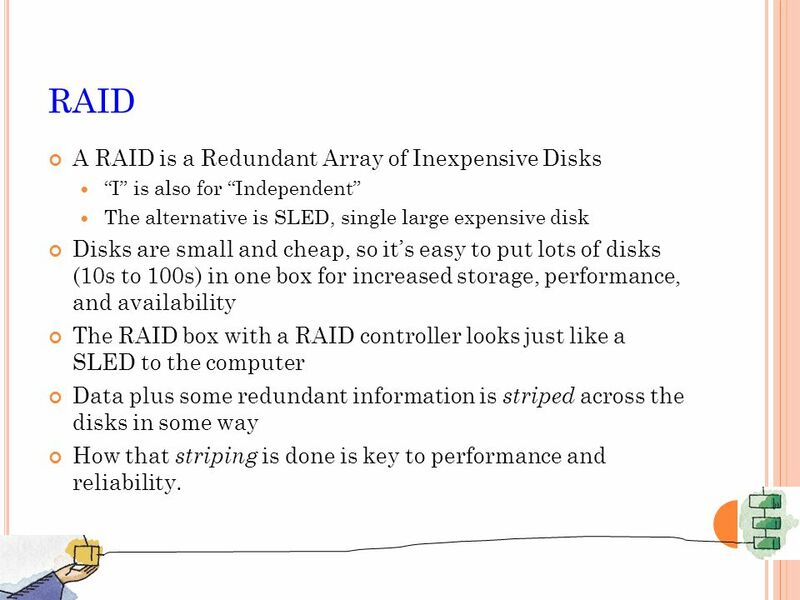 25 RAID A RAID is a Redundant Array of Inexpensive Disks “I” is also for “Independent” The alternative is SLED, single large expensive disk Disks are small and cheap, so it’s easy to put lots of disks (10s to 100s) in one box for increased storage, performance, and availability The RAID box with a RAID controller looks just like a SLED to the computer Data plus some redundant information is striped across the disks in some way How that striping is done is key to performance and reliability. 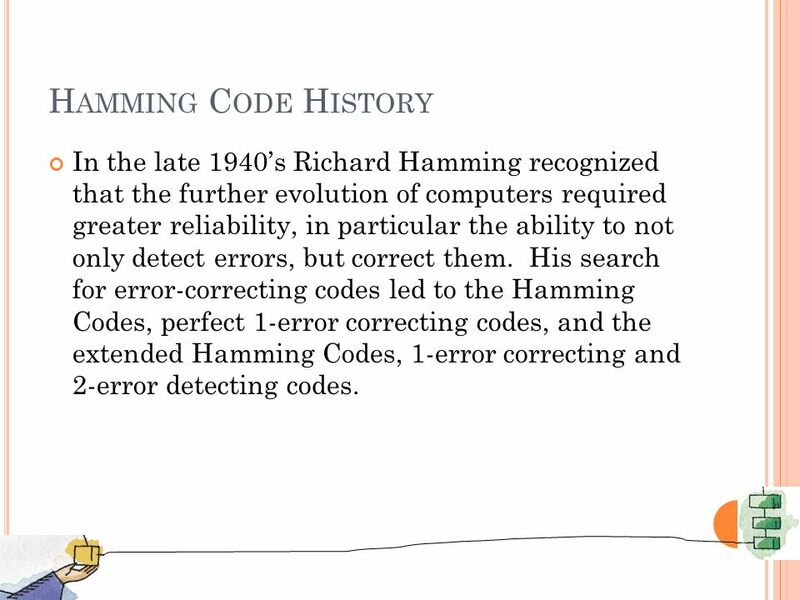 29 H AMMING C ODE H ISTORY In the late 1940’s Richard Hamming recognized that the further evolution of computers required greater reliability, in particular the ability to not only detect errors, but correct them. 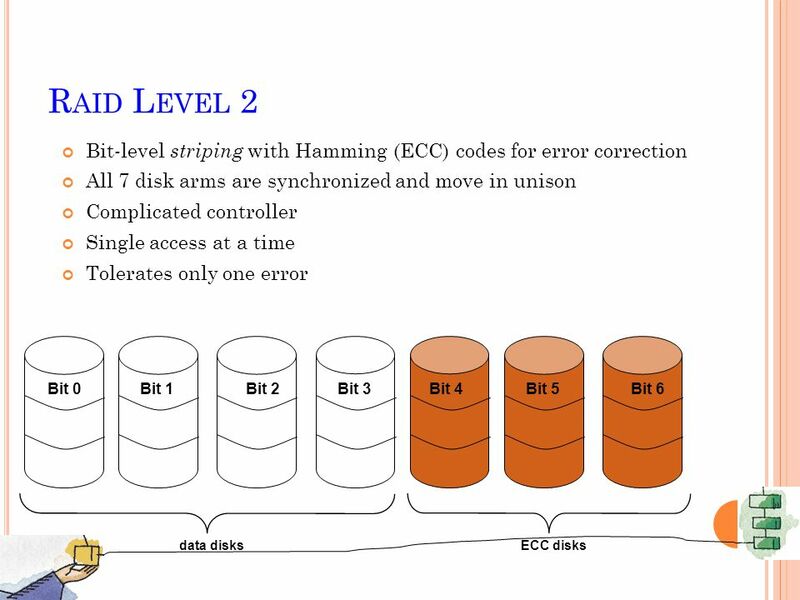 His search for error-correcting codes led to the Hamming Codes, perfect 1-error correcting codes, and the extended Hamming Codes, 1-error correcting and 2-error detecting codes. 31 E XTENDED [8,4] BINARY H AMM. 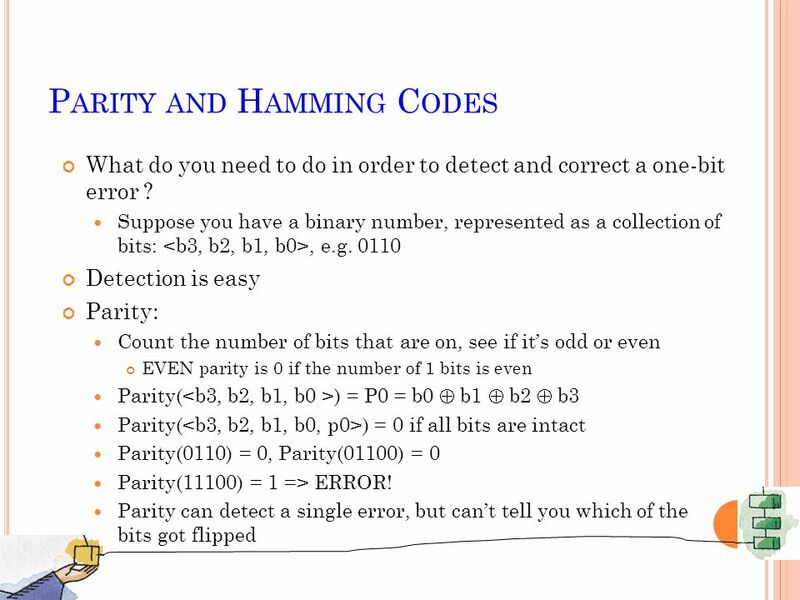 C ODE As with the [7,4] binary Hamming Code: h0 = b0  b1  b3 h1 = b0  b2  b3 h2 = b1  b2  b3 Add a new bit p such that p = b0  b1  b2  b3  h0  h1  h2. 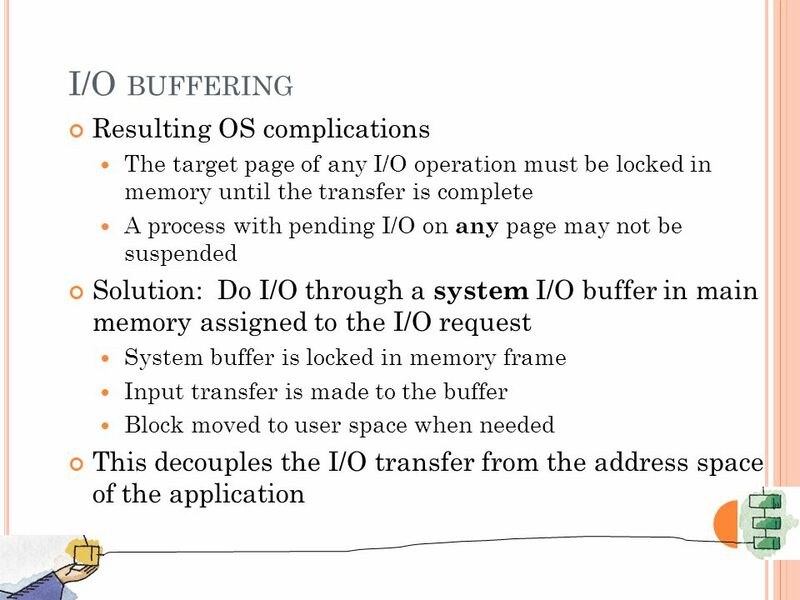 i.e., the new bit makes the XOR of all 8 bits zero. 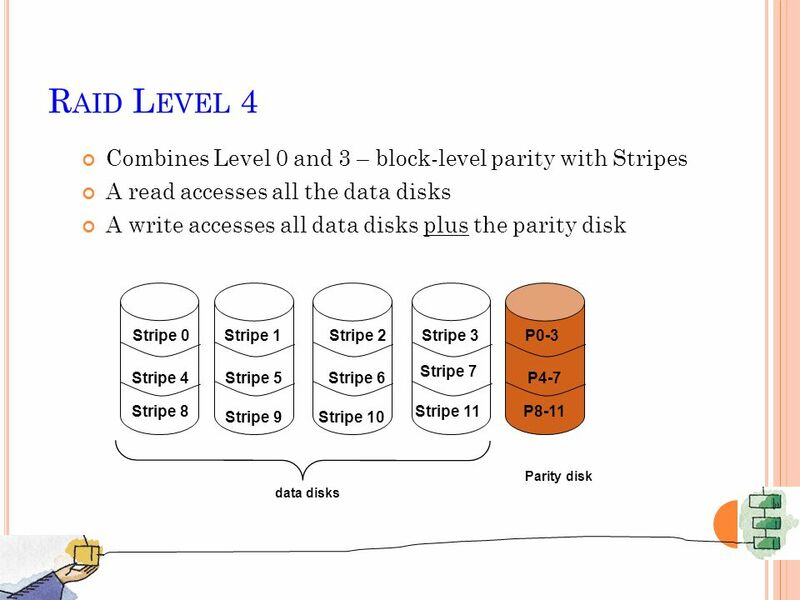 p is called a parity check bit. 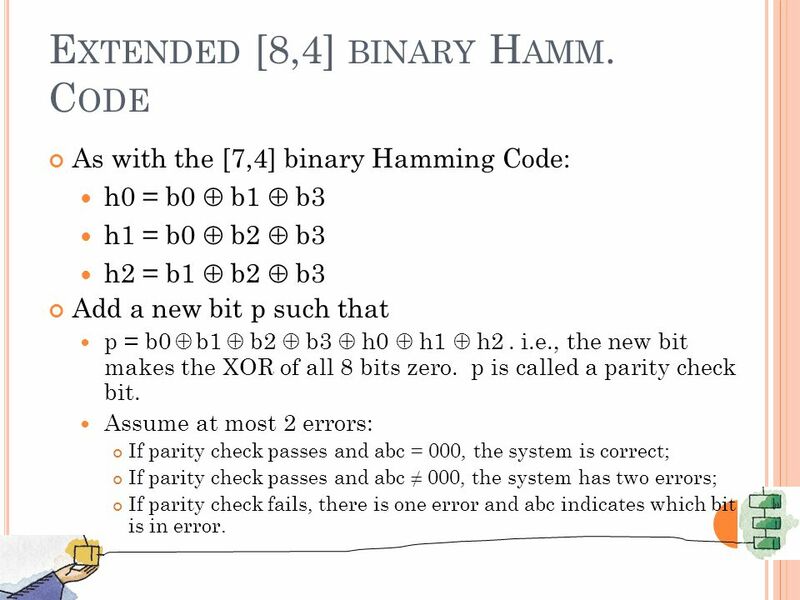 Assume at most 2 errors: If parity check passes and abc = 000, the system is correct; If parity check passes and abc ≠ 000, the system has two errors; If parity check fails, there is one error and abc indicates which bit is in error. 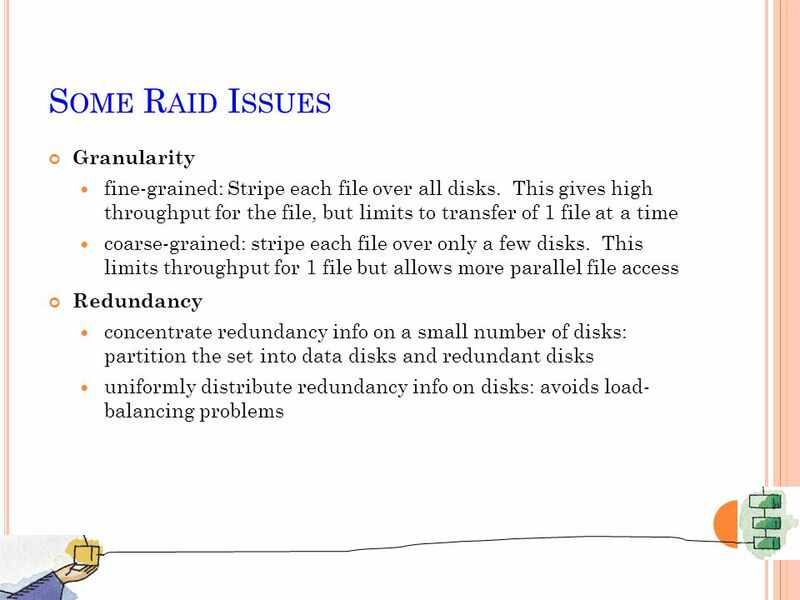 34 RAID 3 X4(i) = X3(i)  X2(i)  X1(i)  X0(i) If drive X1 has failed. 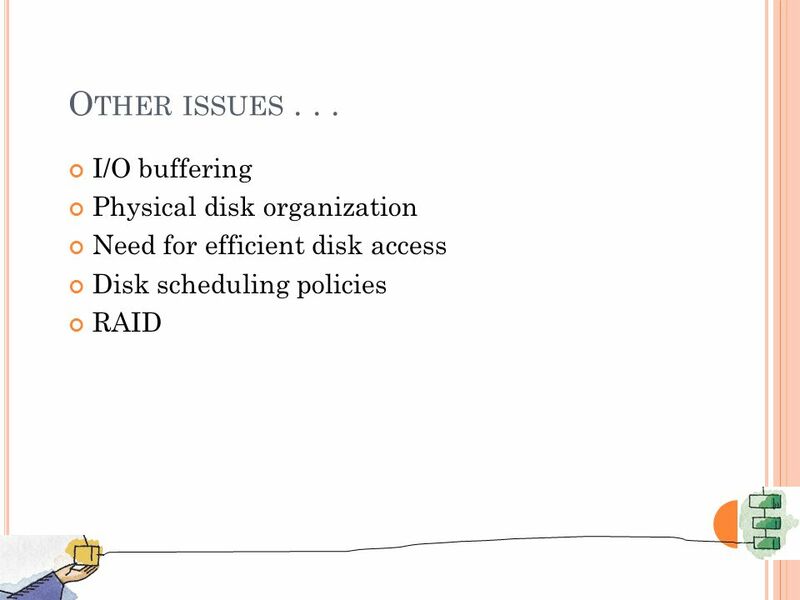 How to recover it? 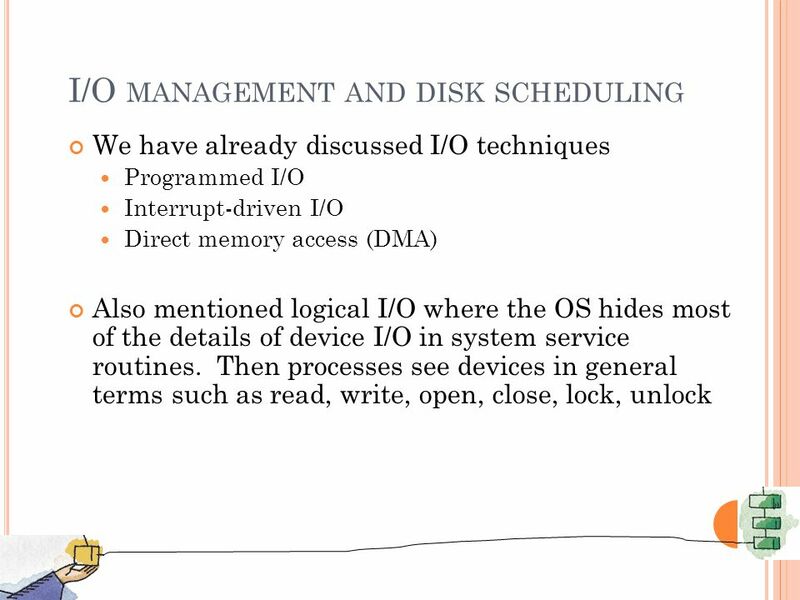 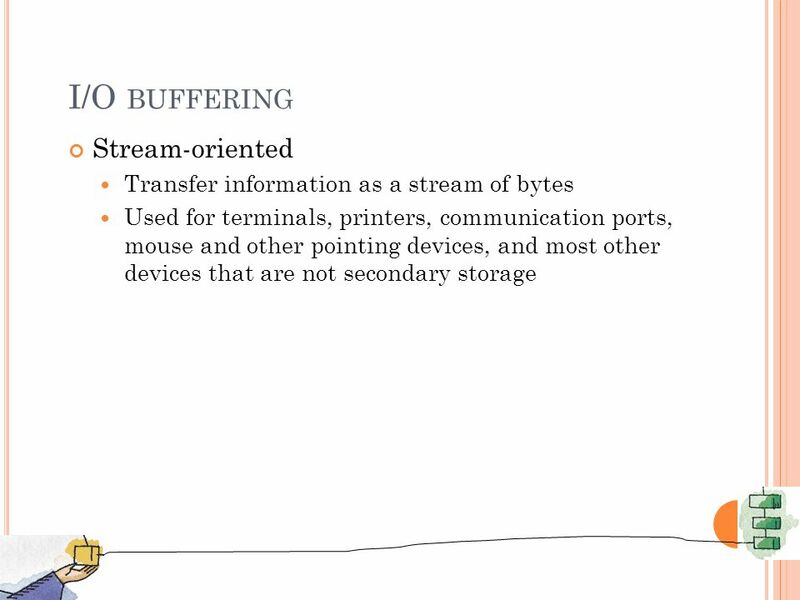 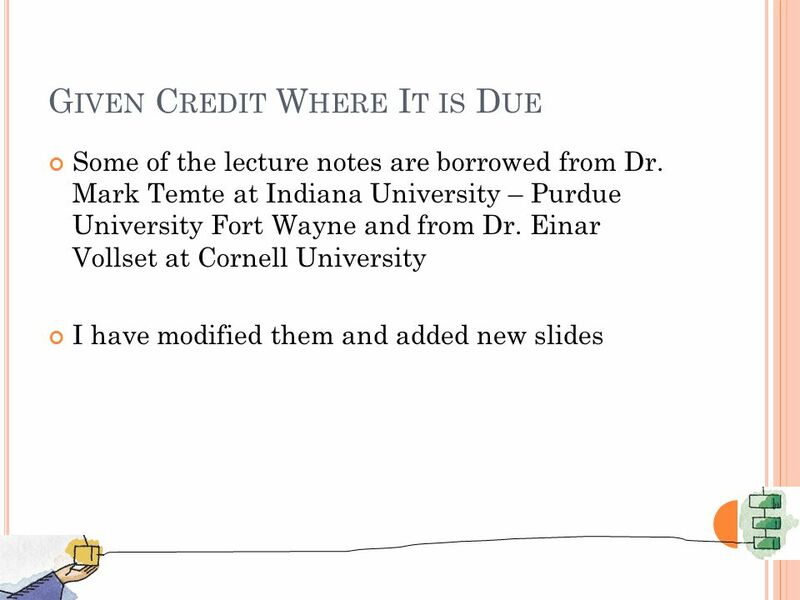 Download ppt "Chapter 11 I/O Management and Disk Scheduling Patricia Roy Manatee Community College, Venice, FL ©2008, Prentice Hall Operating Systems: Internals and." 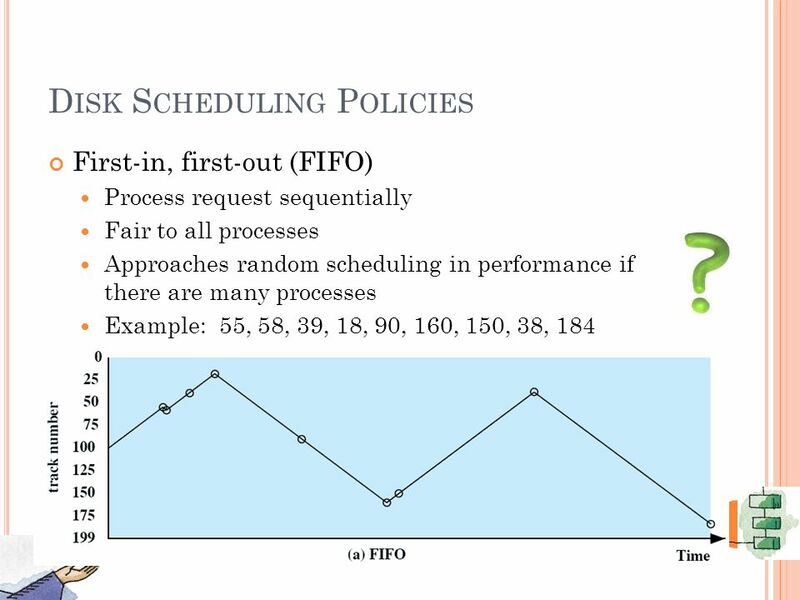 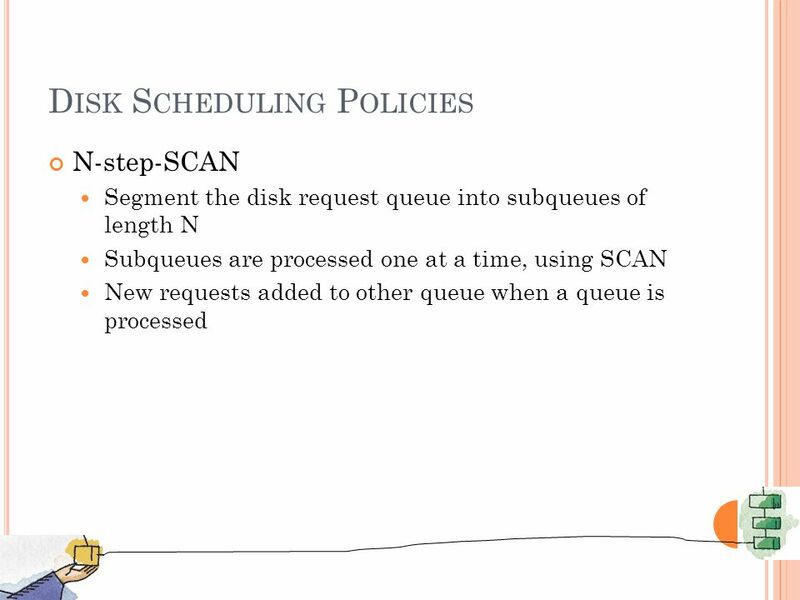 Silberschatz, Galvin and Gagne Operating System Concepts Disk Scheduling Disk IO requests are for blocks, by number Block requests come in an. 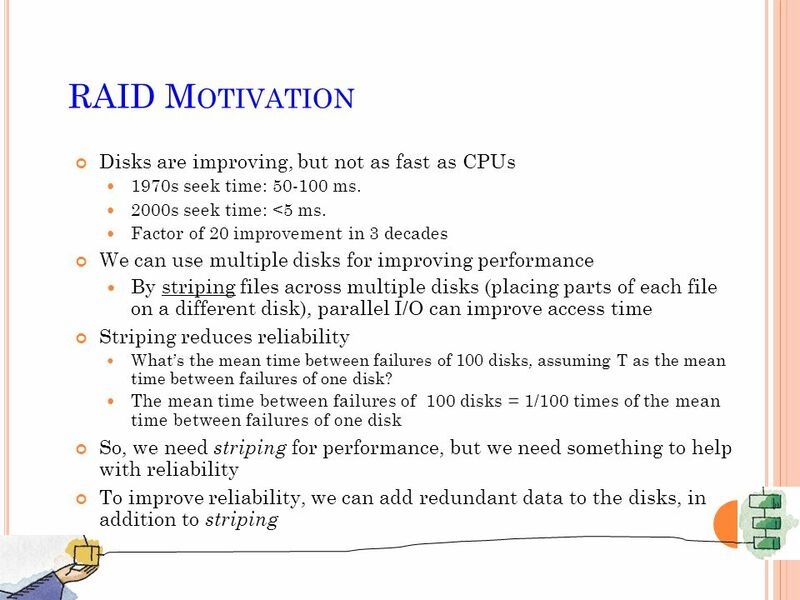 I/O Management and Disk Scheduling Chapter 11. 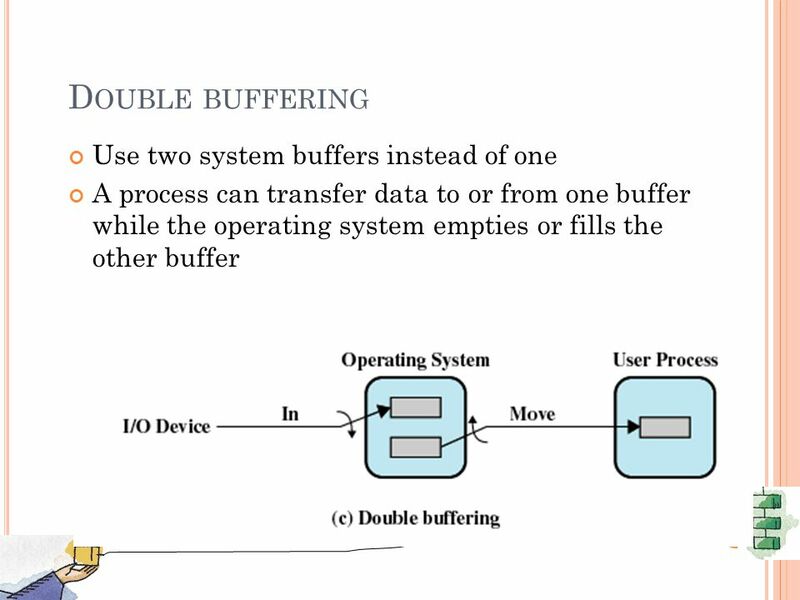 I/O Driver OS module which controls an I/O device hides the device specifics from the above layers in the. 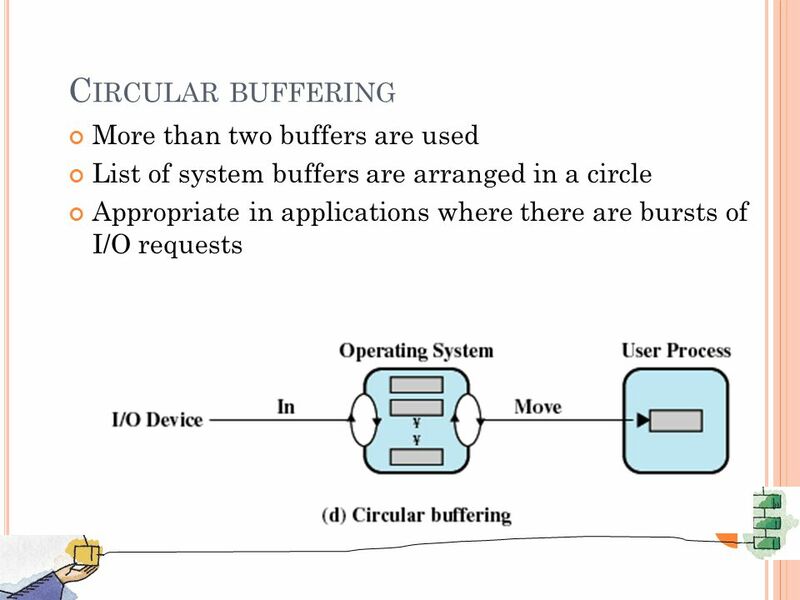 Chapter 4 Device Management and Disk Scheduling DEVICE MANAGEMENT Content I/O device overview I/O device overview I/O organization and architecture I/O. 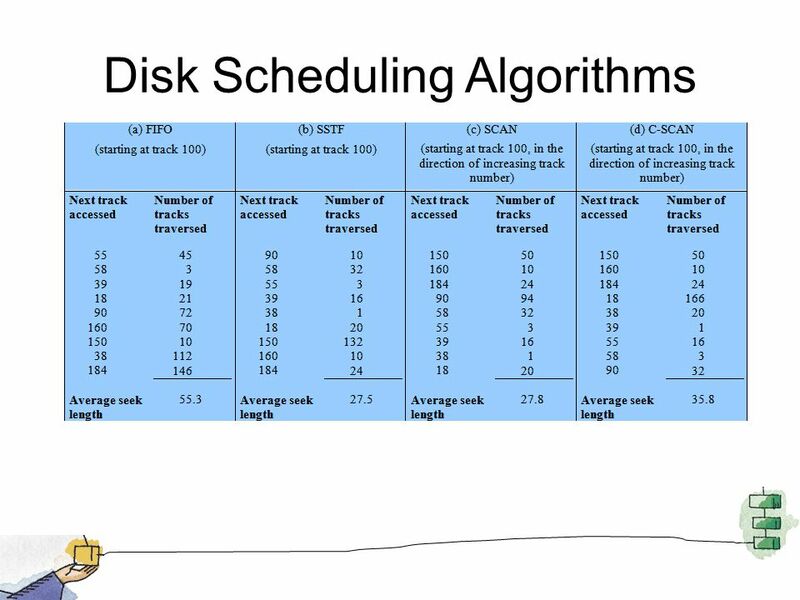 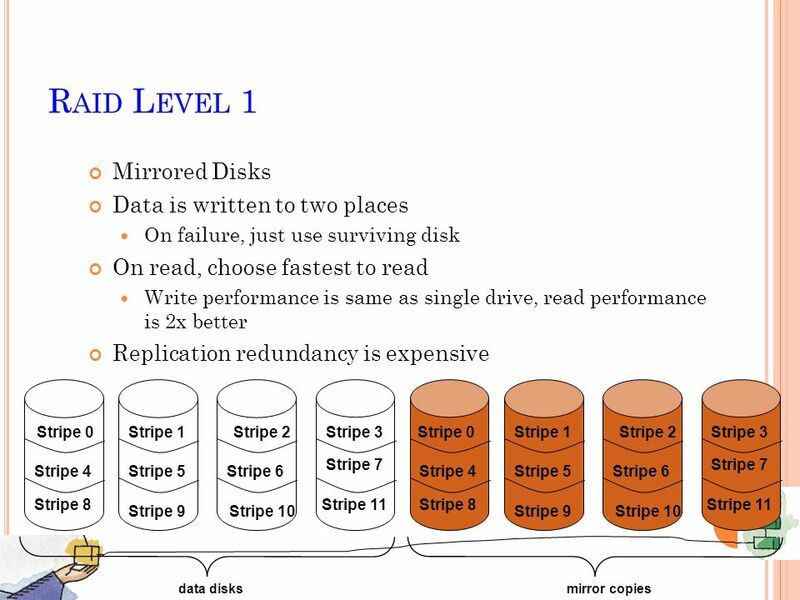 Disk Scheduling Based on the slides supporting the text 1. 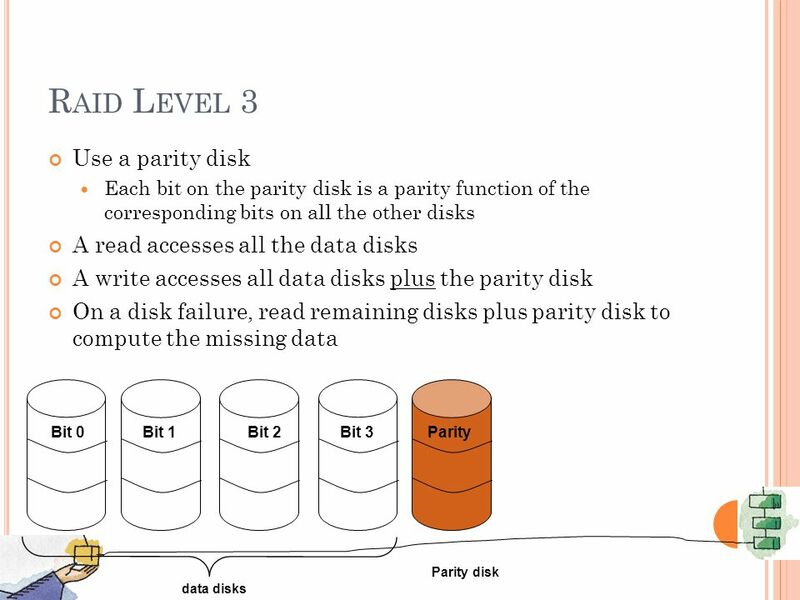 1 File Systems Chapter Files 6.2 Directories 6.3 File system implementation 6.4 Example file systems. 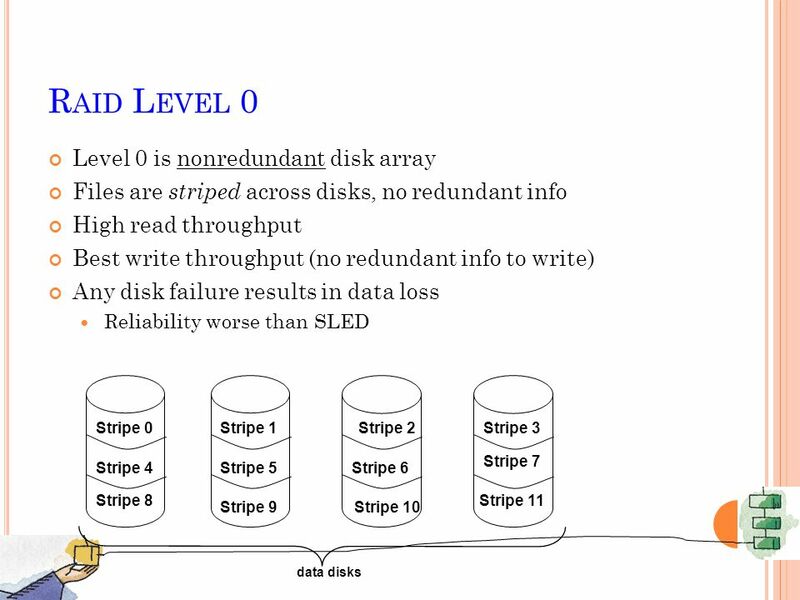 CPSC-608 Database Systems Fall 2008 Instructor: Jianer Chen Office: HRBB 309B Phone: Notes #6.